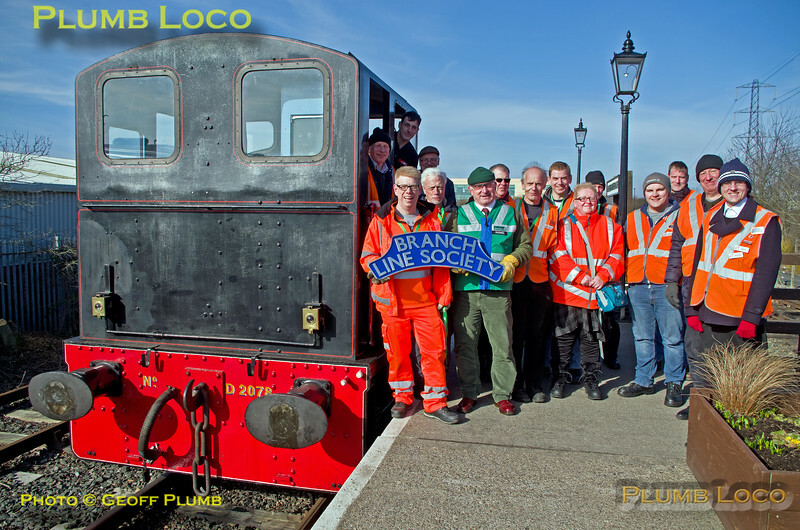 The Branch Line Society organised a weekend based in Newcastle on 24th & 25th February 2018. Saturday was a safety training day for stewards held on the North Tyneside Railway (Stephenson Railway Museum) and conducted by Green Dragon Rail and was a highly informative and valuable day. On the Sunday the "Metro Meanderer" tour was run in conjunction with Tyne & Wear Metro and Nexus Rail, raising funds for the charities Mind and St. John Ambulance, as well as the North Tyneside Railway. The weekend also included a "micro-tour" on the Tanfield Railway on the Sunday evening, taking in the rare (for passengers) curve from the main line to Sunniside into the yard at Marley Hill. All in all, a great weekend that was most enjoyable. As usual a few shots to start with, more to add as time permits. During the BLS training day at the Stephenson Railway Museum in conjunction with Green Dragon Rail, trainees stand alongside Class 03 No. D2078 at Middle Engine Lane station platform, before continuing the courses, along with railway and Green Dragon staff.12:02, Saturday 24th February 2018, a bright and sunny but very cold day. Digital Image No. IGMP33791.